There are lots of craft ideas in this peach and ivory baby girl nursery as well as a DIY furniture painting project, an easy crib mobile and many sweet and unexpected features that are sure to inspire moms to create something spectacular for their own baby's room. The nursery is furnished with a beautiful antique white or ivory crib, a changing table and a dresser, the usual items included in every baby's nursery. 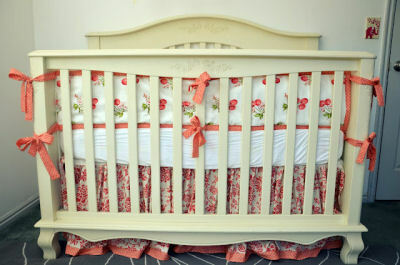 Visit our gallery of baby nursery pictures to see more nurseries decorated in peach and antique white. The furniture holds a few surprises; the baby's cherry crib bedding in shades of peach is the unexpected treat that I promised. And what a treat it is! Go here to see more . Mom, Ashley, had a clear vision of how she wanted to decorate her baby girl's nursery only to learn that she couldn't find the baby bedding or decorations that she had in mind at any of the baby boutiques or online stores. I'm guessing, but I imagine that most crib sets with cherry print fabrics that she found while out shopping featured red cherries, not peachy ones. Nobody had what she needed for sale so she ended up buying the cherry print fabric and making the crib bedding set including the bumper pad and crib skirt herself. The results, as you can see from the nursery pictures, are amazing! However, Ashley says that making the set was one of the best and the worst of the project's experiences. 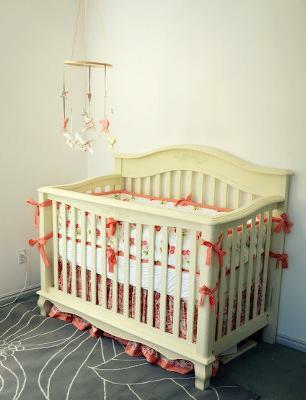 But the custom cherry crib bedding was by no means the ONLY idea for homemade nursery decorations that she had. During her pregnancy, Ashley went through a time that she refers to as her "nesting" phase when she kept busy with some fun crafts projects. 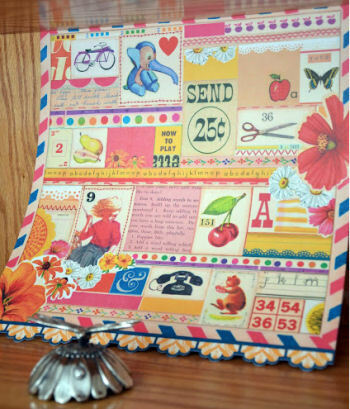 She put the energy to use and made this pretty pinwheel baby mobile using ribbon left over from an Anthropologie bag, a cheap embroidery hoop and scrapbook paper with a total cost of less than $10 ($9.26 to be exact). And she didn't stop with making baby girl a custom pinwheel mobile. When baby girl's bargain savvy grandmother found a changing table/dresser combination at a garage sale for only $25 she made it into something fantastic! If you've done much shopping for nursery furniture lately, you know this was a steal of a deal but it took lots of work to bring it around. 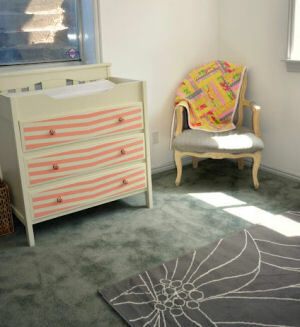 peach and ivory baby girl nursery; it was an ugly shade of brown. This is the picture of the re-claimed dresser AFTER the makeover that included painting and the addition of the cute Anthropologie knobs (total cost of the makeover $30). To see the BEFORE pictures, please visit Johnny and Ashley's Blog. 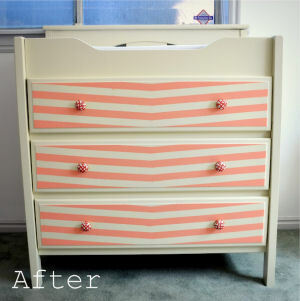 Please..go there now to see what a difference some paint and new dresser drawer pulls made. And don't forget to leave a comment telling her that you think she did a super job. The antique white or ivory paint color of the changer is reflected in the elegant chair draped with a colorful quilt to the side. The upholstery of the armchair and charcoal gray color of the area rug are a perfect complement for the light and airy shades of pastel peach seen elsewhere in the room. Ashley also made the storage boxes on the baby's bookshelf. As beautiful as the crib bedding, custom changing table and pinwheel mobile are; I'm SO knocked out (and a little envious) of the organization in this area. 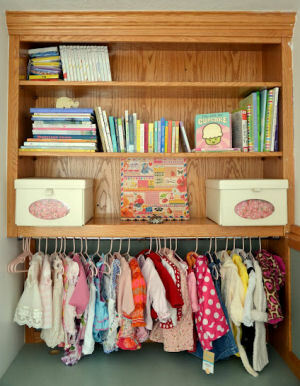 Johnny and Ashley's baby girl's clothes serve as part of the nursery's decorations. Her little outfits are just perfect for the nursery color scheme. This piece of art brings many colors into the space as well as giving a slight nod to indicate a subtle elephant or cherry nursery theme. In fact, it's the only item featured in the peach and ivory baby girl nursery pictures that suggests that there is a theme of any kind in play which is exactly as it should be. I hope that Unique Baby Gear Ideas' visitors have enjoyed the tour of this baby girl's room as much as I have. I made a pinwheel crib mobile using your pictures as inspiration and it turned out so well! Thanks very much for sharing your ideas and for letting me know that a set of homemade crib bedding with ruffles is probably not the best sewing project for a beginner such as myself. So cute and not over the top cutesy! This nursery is darling!! Love it! I'm in the "nesting" phase of my pregnancy right now. You've created such a comfortable spot for your baby with items that I think I can duplicate for my own baby. I love your nursery decor and appreciate the fact that the crafts aren't gender biased since we have chosen not to know the gender of our baby until the birth. With your decorating ideas, I can start to create ahead of time! Thank you! Who taught you to sew? The bedding and dust ruffle are one of a kind and truly beautiful! They look so pretty in the photos. Love that these colors are fresh and non trendy for a girl. Love all the DIY too...takes creative talent for sure! This is so cute!!!! Love it! So cute Ashley. Love it! I am very impressed. Very good job. I love everything about this room! Especially the baby that belongs to it. I love this room. So classic and creative! This baby girl room is SO cute and the most original one I've seen. The price is a huge bonus too! I love the obvious skill Ashley has in making all these great nursery pieces! What a creative mom! Her family is lucky. I love it!!! You are so creative!! Love the details in this room! I wish my nursery looked like that! Very unique - if I ever had a girl I would decorate her room like this. So creative! Will you come decorate my nursery when I have a baby?! This is unbelievable. 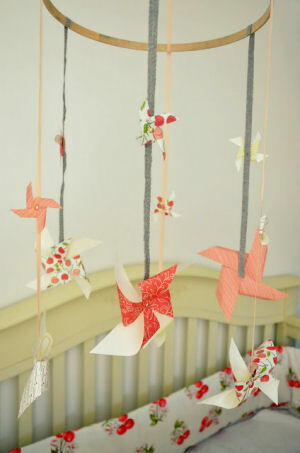 I hope I can have a nursery as cute and creative and cheaply done as this when I am a mother. You are an inspiration to many. I bet you are a cool mom too- thanks for sharing with us! Your baby is a very lucky girl. My wife loves the bedding! Oh so cute! I love everything about it! I vote for Ashley! It's beautiful! Thank you for featuring my little girl's nursery!